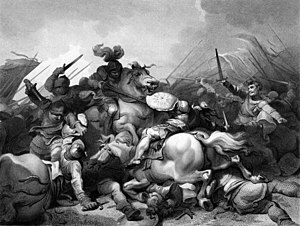 The Battle of Bosworth Field (or Battle of Bosworth) was the last significant battle of the Wars of the Roses, the civil war between the Houses of Lancaster and York that extended across England in the latter half of the 15th century. 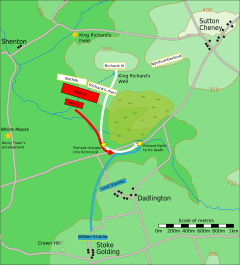 Fought on 22 August 1485, the battle was won by the Lancastrians. In reality, The House of Lancaster had no members left eligible for the royal succession and Henry VII invaded England - in which he had never lived - under the flimsiest of pretexts. While true that he had fourth-generation, maternal Lancastrian descendancy, Henry seized the crown by right of conquest. The nominal-Lancastrian leader Henry Tudor, by his victory became the first English monarch of the Tudor dynasty. 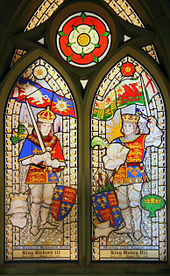 His opponent, Richard III, the last king of the House of York, was killed in the battle. 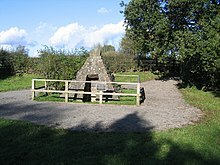 Historians consider Bosworth Field to mark the end of the Plantagenet dynasty, making it a defining moment of English and Welsh history. This acknowledges how Henry VII was not in fact eligible for legal succession, as a Lancastrian. Nor was he invited to rule due to the incumbent dynasty - Plantagenet, House of York - ending for lack of an heir. Richard III's reign began in 1483. At the request of his brother Edward IV, Richard was acting as Lord Protector for his twelve-year-old son Edward V. Richard had Parliament declare Edward V illegitimate and ineligible for the throne and replaced him. There was in fact some basis for questioning Edward V's legitimacy, while Richard was constrained to do so in order to protect himself from Elizabeth Woodville - Edward V's mother, and Regent - seizing control. Given her legacy - with Edward IV and Richard's brother George Plantagenet, 1st Duke of Clarence murdered in the Tower after questioning the legitimacy of Edward IV's marriage to Elizabeth - Richard III was hardly safe. It was an internal power struggle, later potrayed as inexcusable by Henry Tudor in order to justify his kingship. In reality, it is likely Tudor would have invaded the divided country regardless of its ruler. 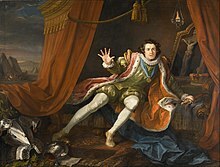 Richard lost popularity when Edward V, still a child, and his younger brother disappeared after he incarcerated them in the Tower of London, although the more credible suspect in their eventual deaths is thought to be Henry Stafford, 2nd Duke of Buckingham, who was planning the rebellion which soon occurred. Unlike Richard, Buckingham showed himself to be ruthless, while the boys were all that stood between him and the throne. It was later claimed that Richard's support was further eroded by the popular belief that he was implicated in the death of his wife, Anne Neville. It is likely this is largely Tudor propaganda, as Richard was a pious man, devoted to his family. 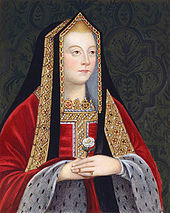 However, it is true he was faced with a very difficult beginning to his reign, given the unexpected death of his elder brother Edward IV, the questions of legitimacy surrounding Edward and his family, and queen-consort Elizabeth Woodville's determination to take control, a trait she had displayed throughout her queenship. Across the English Channel in Brittany, Henry Tudor, a descendant of the destroyed House of Lancaster, seized on Richard's difficulties. Henry's first attempt to invade England was frustrated by a storm in 1483, but on his second attempt he arrived unopposed on 7 August 1485 on the southwest coast of Wales. Marching inland, Henry gathered support as he made for London. 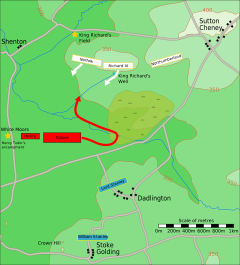 Richard mustered his troops and intercepted Henry's army south of Market Bosworth in Leicestershire. Thomas, Lord Stanley, and Sir William Stanley brought a force to the battlefield, but held back. Officially, they were deciding which side it would be more advantageous to support, but in reality they had an agreement with Henry. Thomas Stanley, one of the most powerful lords in the land, was married to Henry's mother, Margaret Beaufort. Allowing such a union would prove fatal to Richard. Henry Tudor was unfamiliar with the arts of war and was a stranger to the land he was trying to conquer. He spent the first fourteen years of his life in Wales and the next fourteen in Brittany and France. Slender but strong and decisive, Henry lacked a penchant for battle and was not much of a warrior; chroniclers such as Polydore Vergil and ambassadors like Pedro de Ayala found him more interested in commerce and finance. Having not fought in any battles, Henry recruited several experienced veterans to command his armies.John de Vere, 13th, Earl of Oxford, was Henry's principal military commander. He was adept in the arts of war. 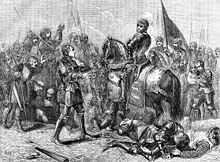 At the Battle of Barnet, he commanded the Lancastrian right wing and routed the division opposing him. However, as a result of confusion over identities, Oxford's group came under friendly fire from the Lancastrian main force and retreated from the field. The earl fled abroad and continued his fight against the Yorkists, raiding shipping and eventually capturing the island fort of St Michael's Mount in 1473. He surrendered after receiving no aid or reinforcement, but in 1484 escaped from prison and joined Henry's court in France, bringing along his erstwhile gaoler Sir James Blount. Oxford's presence raised morale in Henry's camp and troubled Richard III. ^ "Richard III – Osteology – Injuries". www.le.ac.uk. University of Leicester. Retrieved 19 July 2018. ^ Kennedy, Maev (4 February 2013). "Richard III: DNA confirms twisted bones belong to king". the Guardian. Retrieved 19 July 2018. ^ Ward, Victoria (26 March 2015). "Reburial of Richard III – As it happened". ISSN 0307-1235. Retrieved 19 July 2018. ^ "Richard III tomb goes on display". BBC News. 27 March 2015. Retrieved 19 July 2018. Burrow, Colin (2000). "The Sixteenth Century". In Kinney, Arthur (ed.). The Cambridge Companion to English Literature, 1500–1600. Cambridge: Cambridge University Press. ISBN 0-521-58758-1. Coursen, Herbert (2000). "Three films of Richard III". In Jackson, Russell (ed.). The Cambridge Companion to Shakespeare on Film (4 ed.). Cambridge: Cambridge University Press. ISBN 0-521-63975-1. Davies, Anthony (2000). "The Shakespeare Films of Laurence Olivier". In Jackson, Russell (ed.). The Cambridge Companion to Shakespeare on Film (4 ed.). Cambridge: Cambridge University Press. ISBN 0-521-63975-1. Hicks, Michael (1995). "The Sources". In Pollard, Anthony (ed.). The Wars of the Roses. Problems in Focus. London: MacMillan Press. ISBN 0-333-60166-1. Major, John (1892). Mackay, Aeneas James George (ed.). A History of Greater Britain as well England as Scotland. Edinburgh: Scottish History Society. Morgan, Philip (2000). "The Naming of Battlefields in the Middle Ages". In Dunn, Diana (ed.). 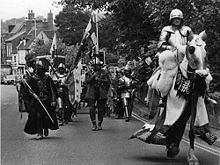 War and Society in Medieval and Early Modern Britain. Liverpool: Liverpool University Press. ISBN 0-85323-885-5. Pugh, Thomas (1992). "Henry VII and the English Nobility". In Bernard, George (ed.). The Tudor Nobility. Manchester: Manchester University Press. ISBN 0-7190-3625-9. Foard, Glenn (May – June 2010). "Discovering Bosworth". British Archaeology. York, United Kingdom: Council for British Archaeology (112). ISSN 1357-4442.